So it seems that the last few deals we negotiated were a success so guess what? We've blagged another! Hot off the heals of our M140i review but more importantly BMW's return to the BTCC with the West Surrey Racing 1 Series, here's a smoking hot finance offer from BMW Park Lane to help get you in one. • Brand New 17 plate M140i. • 3 Years or 36,000 Miles Free Servicing. • Available For March Only. Personally I'd put more of a deposit in to bring the monthly down even further but you get the idea. Naturally you can spec the car as you please and part exchange if you wish. I'm also told that this unique AnyM deal comes with 2 VIP pit lane tickets to the first race of the BTCC season at Brands Hatch. Terms and Conditions: AnyM members only. Park Lane Ltd is a credit broker. 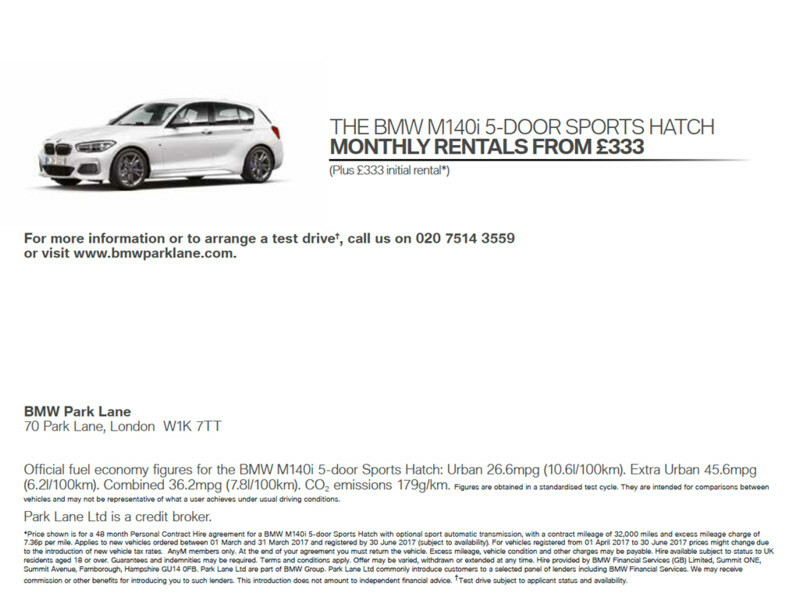 *Price shown is for a 48 month Personal Contract Hire agreement for a BMW M140i 5-door Sports Hatch with optional sport automatic transmission, with a contract mileage of 32,000 miles and excess mileage charge of 7.36p per mile. Applies to new vehicles ordered between 01 March and 31 March 2017 and registered by 30 June 2017 (subject to availability). For vehicles registered from 01 April 2017 to 30 June 2017 prices might change due to the introduction of new vehicle tax rates. At the end of your agreement you must return the vehicle. Excess mileage, vehicle condition and other charges may be payable. Hire available subject to status to UK residents aged 18 or over. Guarantees and indemnities may be required. Terms and conditions apply. Offer may be varied, withdrawn or extended at any time. Hire provided by BMW Financial Services (GB) Limited, Summit ONE, Summit Avenue, Farnborough, Hampshire GU14 0FB. 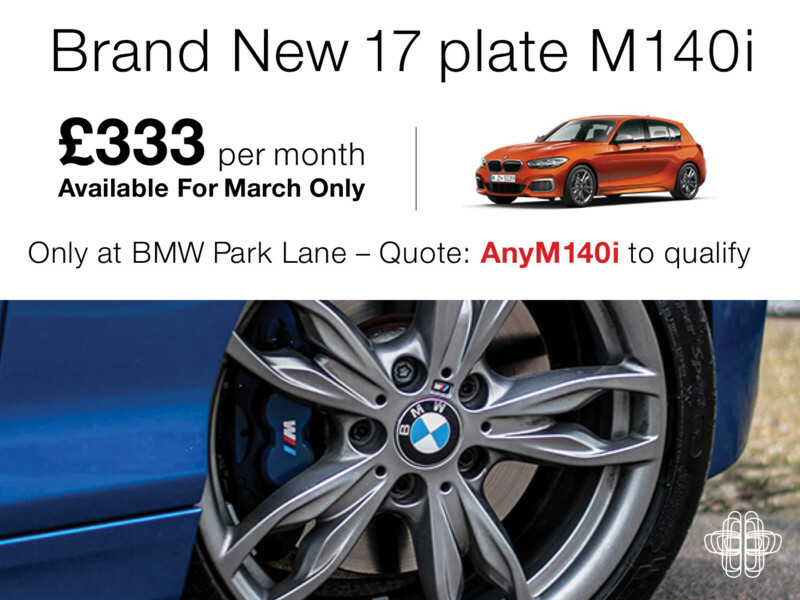 Park Lane Ltd are part of BMW Group. Park Lane Ltd commonly introduce customers to a selected panel of lenders including BMW Financial Services. We may receive commission or other benefits for introducing you to such lenders. This introduction does not amount to independent financial advice. †Test drive subject to applicant status and availability.